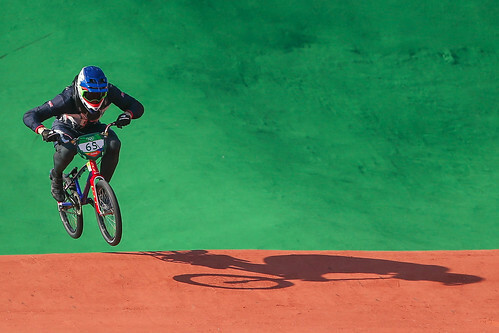 Team GB's Liam Phillips and Kyle Evans took to the Olympic BMX track to start their campaign after a record-breaking effort from their teammates in the velodrome. Liam Phillips finished 10th and Kyle Evans 21st in the seeding run as the BMX started at the Rio Olympic Games on Wednesday. The 32 competitors in the men’s BMX seeding run each completed a lap of the track in order to be ranked going into Thursday’s quarter-finals. “The track is really, really fast and the minute you make one small mistake, that just knocks on to the rest of the lap,” said Phillips. “Just down the second straight I made a small mistake and lost a little bit of speed and that’s all it takes. “When you’re travelling at the speeds we are, a mistake is so easy to come by so to have only made one mistake, I’m quite pleased! “For us, we haven’t put too much emphasis on going out and getting a really good qualifying time; it was just about soaking up the atmosphere, having some fun and trying to get ready for tomorrow. Kyle Evans, competing in his first Olympics after being a reserve in London, completed the run in the sixth fastest time, after 14 riders had ridden their time trial. The 22-year-old made a very fast start, with the second quickest time at the first berm but lost some vital tenths of seconds over the final two straight sections of the course. “It was alright, I made a few little mistakes,” said Evans of his first outing at an Olympic Games. “I think the grandstands are playing with the wind, making it either a head or a tail wind. “For my run there was a big tail wind on the first straight – I charged as hard as I could; I had to try and hit the brakes a little bit and I squashed the jump as much as I could but I overshot still and lost some good time there. “It’s nice to be away, get the nerves settled and be on our way for a good weekend. The Team GB rider’s run ranked him in 21st place overall, and he will now face Connor Fields, Corben Sharrah, Bodi Turner, Anthony Dean, Gonzalo Molina, Tore Navrestad and Yoshitaku Nagasako in the quarter-finals. Twan Van Gendt sat at the top of the standings with the fastest time of 34.933 while 15 riders tried and failed to beat his time until Connor Fields of the USA snatched the lead on his smooth, controlled run. The next rider to take the lead was Switzerland’s David Graf but that was soon snatched by world champion Joris Daudet of France in a time of 34.617. Maris Stromberg, the defending champion had a reasonably good run, finishing in a time of 34.953 and finishing down in seventh place.